EXCOR® Pediatric is a mechanical, pulsatile ventricular assist device (VAD). The paracorporeal VAD is used for the short to long-term support of the left and/or right ventricular pumping function. It is indicated for children with life-threatening diseases with severe heart failure after all conservative therapeutic options have been exhausted. EXCOR® Pediatric is designed for use in young patients, from newborns to adolescents. Berlin Heart offers a comprehensive service plan for this system. Our Clinical Affairs Team - composed of cardiac surgeons and perfusionists, among others - supports you for the entire duration of VAD therapy: starting with product training, consultation for patient selection, on to implantation, postoperative care, and system instruction for treating personnel. If you have any questions, you can contact our experts at any time via the 24-hour hotline. 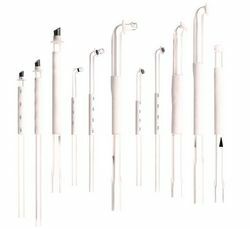 EXCOR® blood pumps are connected to the heart or the vessels near the heart using cannulae. 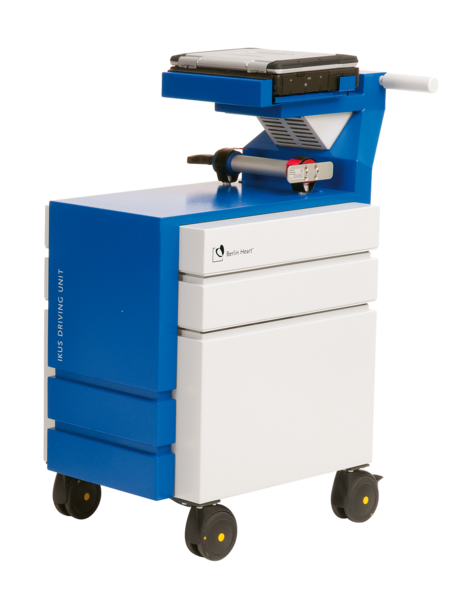 Following implantation, they are initially operated by the stationary pneumatic driving unit Ikus. Individual parameter settings are recorded on the drive for each patient in order to generate a pulsing movement of the blood pump membrane. In this manner, support of the heart function can be achieved/ensured. Following mobilization, there is an option – for patients who are supplied with a 60 ml blood pump – to switch to the mobile driving system Excor. The mobilization of young patients is important to their well-being. For adolescents with a weight starting at approximately 40 to 50 kg, the use of blood pumps starting at 60 ml can be considered. A battery-supplied Excor driving unit can be used with these blood pumps. It allows for free mobility over a space of several hours. The cannulae of the paracorporeal EXCOR® VAD are diverted below the rib cage and through the thorax. Depending on the form of therapy, up to four single wounds will form around the cannula transcutaneous exit sites and must be cared for, as per antiseptic standards, throughout the entire course of therapy. The more thorough the wound care, the lower the risk of wound healing disorders. The dressing assists not only with sterile wound closure. It is also used to immobilize the cannulae in the transcutaneous exit site, whereby the wound healing is supported. In addition, the dressing has a strain-relieving effect on the cannulae. This also fosters the healing process. In the earlier postoperative phase, the change of wound dressing is conducted daily. If healing progresses normally, the interval for changing dressings can be expanded to twice a week. If the appearance of the transcutaneous exit site changes (e.g. circumferential skin reddening, skin secretions, etc. ), wound care will be adapted accordingly. Anticoagulation therapy continues to be a challenge for VAD patients, in particular small children, who do not have a stable, mature anticoagulation system at a young age. The body's own coagulation must be managed by medication in such a manner that no deposits are formed in the VAD system, and no severe bleeding complications or thrombo embolisms are experienced by the patient. Anticoagulation therapy is generally initiated 24 hours after implantation with administration of heparin. If possible, a switch should be made to oral therapy with vitamin-K-antagonists as early as possible. The antiaggregation therapy is conducted with a combination of acetylsalicylic acid (ASA) and Dipyridamole and Clopidogrel, if required. The choice and dosage of medications administered postoperatively is closely monitored. The monitoring includes thrombelastography (e.g. Rotem®) as well as control of platelet function with the aid of aggregometry (e.g. Multiplate™). Anticoagulation is PTT- and/or INR-controlled. The blood circulation is mechanically supported by a VAD. This means that the blood comes into contact with non-biological surfaces such as plastic or metal. The blood reacts to such contact as it does with an open wound: It coagulates, whereby the artificial surface is covered with a biological film. In order to prevent this, the patient receives a medication-based anticoagulation therapy. The blood is analyzed at regular intervals in order to control whether the platelet inhibition is effective. In addition, the blood contact surface of the Excor pump is coated with an anticoagulant (CARMEDA® BioActive Surface*). 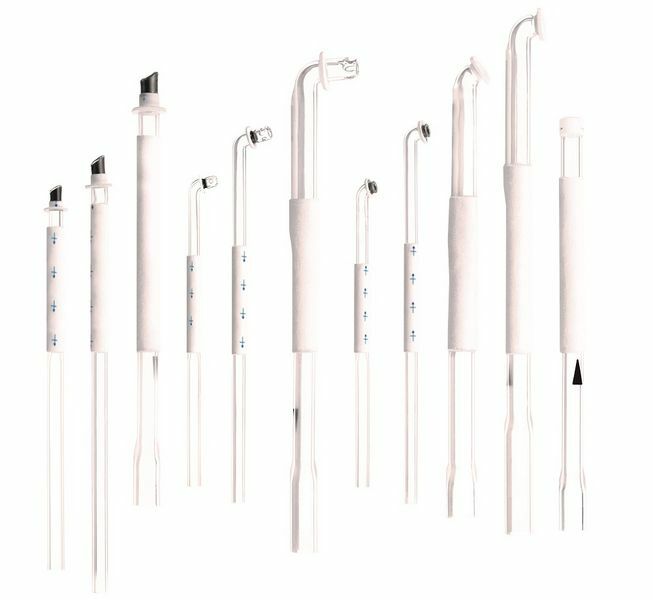 Regular control of the EXCOR® blood pump and of the visible portion of the cannulae is equally important. This control is conducted several times a day with the aid of a mirror and a flashlight. The blood-carrying portion of the blood pump can be inspected through the transparent polyurethane housing. If small fibrin deposits are observed during the pump control, the anticoagulation therapy is adjusted. If a thrombus-like formation is already present, the blood pump is replaced. The membrane, which alternates continuously between pump filling and pump emptying, can be easily identified through the also-transparent housing for the air side of the blood pump. It is possible to tell, based on the membrane movement, whether the drive parameters have been optimally set or whether optimization is necessary. The EXCOR® VAD is a pneumatic ventricular assist device. A triple-layer membrane serves to delimit the blood and air sides of the blood pump. The membrane is curved and can be set in motion through alternating pressures. The pressures originate from a driving system and are channeled into the pump via a tube. If positive pressure is applied on the membrane, it displaces the blood out of the blood chamber and back into the patient's circulation. With a negative pull, the blood pump fills again with blood. Valves in the inflow and outflow stubs ensure that the blood can only circulate in one direction. The blood pumps differ in the size of their stroke volumes, i.e. the volume of blood displaced with each stroke. The pump rate setting determines how often the membrane moves in one minute. The rate should be chosen in such a way that the resulting blood flow meets the patient's requirements. The IKUS is a powerful stationary driving system for operation of the EXCOR® blood pumps. The system possesses a variety of setting options to optimally support patients of all ages and weights at every point during their EXCOR® therapy. All control-relevant system components are designed redundantly in order to offer a maximum of safety. 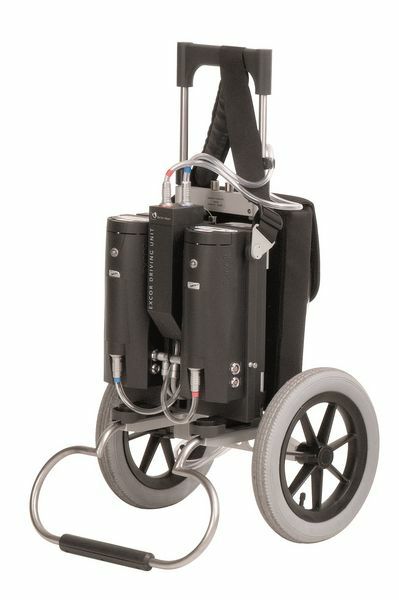 Although conceived as a stationary driving system, battery operation allows for a patient on the system to move within hospital premises. The settings can be reviewed and optimized at any time, if needed, via a laptop integrated in the driving system. The filling (diastole) and emptying (systole) pressures are individually set for every patient in such a manner that the blood flows through the VAD as gently as possible. 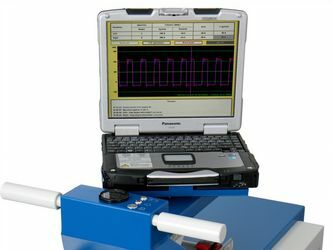 The typical rectangular curve progression that is presented on the laptop is formed through the compressor technology used, with which the alternating pressures are generated.